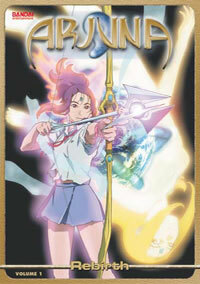 Distributor: Licensed by Bandai, also available streaming on Hulu and Tubitv. Notes: Brought to us by the famed team that, created Macross Plus, Escaflowne, Cowboy Bebop, and Geneshaft. That should tell you about what to expect, right? Juna is a normal sixteen-year-old girl, coping with everyday problems, like studies and trying to excel in her archery club. Pollution is not a priority on her problems-to-solve list. Fate chooses to deal her a different hand when she dies in an accident. She's offered a second chance at life by a mysterious character, Chris, in turn for taking up the job as the new Avatar of Time. Bestowed with magical powers, she has to help a secret organization known as SEED to fight against the Rahja that threatens the planet. Juna will begin on a journey of self-discovery and learn about the plight of the planet. Will she be able to save the Earth in time? Truth be told, being a big Sakamoto Maaya fan, I got wind of the music first. I knew that Kanno Yoko was on board and decided that I absolutely had to see this anime. First warning: This anime is very pro-environmentalism. You can only go two ways with it; you are going to hate it or you are going to love it. There is no in-between. Second warning: This is a magical girl anime. Make no mistake about it. I mean, where else can you find a being with a luminous pink body, flaming hair and a blob of blue flame floating in front of her forehead? But deep in its core, Arjuna is really a love story, where the heroine has to come to terms about her new responsibilities and her other half has to support or ditch her. It is a very realistic anime that deals with problems close to our hearts. It is also an anime that is very easy to get into. You relate instantly to Juna and her environment, her struggles, her feelings, her dilemma. True, she has enormous powers but at the end of the day, she is but one individual and there's only so much she can do. And the Rahja are the result of our pollution. Is it right to destroy them? You feel as if you are learning right along beside her. I like the way the show actually implies that we are conformists and that as we break away from the norms (as Juna did), we will be increasingly view as freaks, as outcasts. While depressing issues are dealt with, the anime itself takes on a hopeful message. Like the opened Pandora's box, Hope lies at the bottom. There are no fancy magical wands and (God forbid!) make-up lockets that follow Juna's transformation. In fact, there are only two detailed transformation sequences. The rest of it are dependent on the mood the particular episode follows. Each of the scenes is unique and even the colors she assumes have a deeper meaning. The only gripe I have with this anime is that they never get around to explaining the origin of the Avatar of Time. Although the ending is quite satisfying as befits such anime, it is still very open-ended. And all the time, there's the not-so-subtle Hindu reference going on (Arjuna, Ashura, Gandiva bow). Must be the cool factor! While the anime itself preaches moderation, the graphics department of this anime is anything but moderate. The scenes are so detailed and realistic that at certain points of time, I wonder whether I'm looking at animation or live action footage. Fans of eye candy will not be disappointed. CG is used often to portray the Rahja giving them a surreal and menacing feel. The quality remains consistent. From the music department, you can expect nothing but the best from Kanno. New age, tense melodies mark battle sequences, which are fast and furious. Beautiful melodies convey the mood of the series. And with Maaya performing some of the vocal tracks, nothing can go wrong! Oh, and make sure you stay when the end credits role after each episodes since each sequence is unique and the ending themes will sometimes change. In fact, I counted at least five different ending themes! And...are you still reading this? Get off your chair and buy/beg/borrow Arjuna immediately! While you are at it, might as well grab the two excellent OSTs. Recommended Audience: 12 and above. While there's nothing overtly violent (the Rahja causes collateral damage), it takes a mature mind to understand issues like pollution, death, destruction, globalization, poverty and starvation. No profanity but numerous adult situations like unwanted pregnancies and divorce. And there is one 'near' sexual encounter between Juna and Tokio.